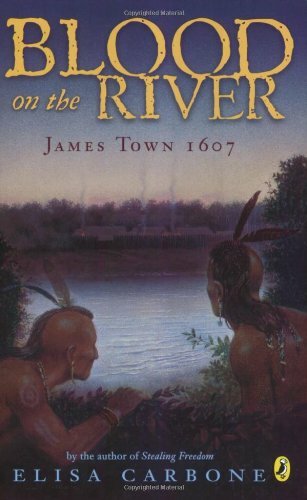 Blood on the River: James Town 1607 by Elisa Carbone is a young adult historical fiction account of the first permanent English settlement in North America. I read the book to my 11- and 8-year-old boys, and though they felt the beginning chapters were a little slow, they eventually got into the story and wanted me to keep reading. As for me, I thoroughly enjoyed the whole book. The story is told from the perspective of Samuel Collier, a young orphan boy who was almost destined to live his life in the streets of London. He got a second chance when he was assigned a job aboard the Susan Constant as page to Captain John Smith. Now he has to make his way in the New World, and what he needs to do to survive there will be much different from what he’s learned about living on the streets. He soon finds out that he’ll need to get along with others whether he likes it or not. He’s also going to need to learn the language of the Algonquian Indians. Carbone does an excellent job of relating the major events of the James Town settlement in an appropriate way for young adults without sugarcoating the hardships or atrocities that took place. I especially appreciated how she clearly defined the characteristics of a good leader, which is a good lesson for children. She begins each chapter with a quote from a primary source, which allows kids to hear snippets of eyewitness accounts. If you feel your child is very sensitive, you may want to read this book first, but most children will probably find the story fascinating. Since the book is fiction, the historical account should be read with a skeptical eye, but it may spark an interest in early American history, and that’s always a win.